The popular Rongai route will be conquered yet again, this time by David Gilchrist. While David climbs to the top of Africa, Virginia (his wife) will trek through Masai villages, see lakes and camp. She will visit the traditional tribe of the ‘Click’ people and go for a day of hunting with the bushmen. 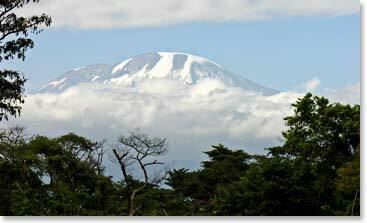 On her last trekking day she will be driven to the bottom of Kilimanjaro, Mweka gates to welcome David. After a good night’s rest back in Arusha , the couple will continue their venture together by exploring the Serengeti on our 6 day safari. Stay tuned for their daily reports on this amazing Africa adventure! September 19, 2008 – Dave and Ginny Spot their First Cheetahs! September 14, 2008 – Dave is Down and Excited to See Ginny! September 13, 2008 – Dave Climbs Hard and Makes It to the Summit of Kilimanjaro! September 12, 2008 – Excited to Reach the Summit! September 11, 2008 – Day Three and Going Higher! September 8, 2008 – We’ve Arrived Safely in Tanzania!